ezine,magazine and e zines,free ezine: April 30, 2005 Issue! You know the popularity of eBooks. But what you have seen is only a sample fire works of the impending explosion. Major publishers world wide are pumping billions into online publishing. This will obviously work as a catalyst in changing the attitudes of people about reading a book online or from their computer. i.e. It's for sure that eBooks will see a tremendous explosion in the coming years on the Internet. You will find many more million readers gravitating into eBooks and online reading and the eBook explosion is going to be huge! How about a slice of it for yourself? The most important thing to remember is, you do not need money making or Internet marketing eBooks to make money! In fact, far more profitable, less competitive markets are there for you to savor. And what is the easiest way to create your own materials? Just bite into free public domain information. Compile your own eBooks from freely available government information that anybody can access free and publish without any copyright headaches. Use them as it is or combine them, connect them and bring out something new! Yanik Silver has very good resource on Public Domain Information. You may check it out here. "Boost Your PageRank Sky-High With One Convenient, Easy-to-Use, Inexpensive Software Program... ! For the past one year I have been enjoying a pagerank of 5 without doing anything special and then suddenly, now it shows a low 4! Well! It opened my lazy eyes and brain. I have begun working at a high pitch to find my way back to at least a pagerank of 6 by fusing the traditional and the modern ways (which I think should be the strategy). Now, PageRank is one of the methods Google uses to determine a page�s relevance or importance. Google will only consider a link pointing to your site as relevant, if the site that's pointing to you has a page rank of at least 4 of 10. What this means is, Google is trying to provide quality content sites with more exposure, and by using their page ranking system, only the sites with relevant, quality content will be considered in both the search results and the link exchange calculations. And while working at getting my pagerank back, this immaculate tool came to my attention. 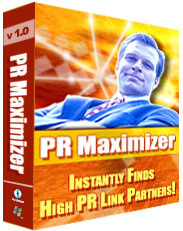 PR Maximizer is a spectacular, very well thought-out software product that guides your search for relevant link partners. It also sorts them according to their PageRank along with many other important values. So how do YOU increase your Page Rank? You get yourself a copy of PR Maximizer and begin immediately to find relevant link partners. It's just that simple. RSS gets 100% of your content delivered, but it's no good if no one subscribes to your feeds. So your first order of business after planning and creating your feeds has to be promoting them to your visitors. Usually, if clicking on the RSS button, the visitor only sees a lot of confusing XML code. They in fact need to copy & paste the link in to their RSS reader. But since most still don't know what RSS is, using this approach will only waste potential subscribers. To achieve success, you'll need a different approach. Then, on this same page, include the links to all of your RSS feeds. B] Now promote this RSS presentation page as much as you can using all of your available channels. It's all about location, just like with the subscription box for your e-zine. If they don't see it, they won't subscribe. And if you don't motivate them enough to check-it out, they'll just ignore it. A] Promote your RSS feeds directly below your e-zine subscription box, and always "above the fold". Promote your RSS presentation page (telling your visitors that's where they can subscribe to your feeds) on the most prominent locations of your site. feed on E-mail Marketing, promote the RSS feed at the top of the topic home page, and in every E-mail Marketing article you publish. These links should actually be direct subscriptions links to the feeds. C] Promote your RSS feeds in all of your e-mail messages and e-zine issues. to your content in the first place and why they should subscribe specifically to your RSS feeds. Some internet browsers, such as Firefox, make it easy for their users to subscribe to RSS feeds. The browser actually asks the user if he wants to subscribe to the feeds the browser finds on the site the user is currently on. Yes, this is even more powerful than your e-mail subscription form, since the browser in a way "pushes" the user with your RSS feed subscription. But in order for the browser to do this, you need to help it out to find your RSS feed. There are many more techniques and opportunities available to you, from "direct subscribe" links to actually using opt-in forms, but these 7 steps should get you started in the shortest time possible, and help you achieve a better visitor-to-RSS-subscriber conversion rate than the huge majority of sites are achieving today. 1. Teleseminar Audo (MP3) - : Priya shah, an expert on blogging, discusses "Using Blogs to Market Your Products & Services." If you are non-technical person who want to market your products and services online, blogs are ideal personal branding vehicles that you can use to grow your influence and establish yourself as an expert in your field. Here's the audio of the teleseminar hosted by Denise Wakeman and Patsi Krakoff. 2. Web Form Designer -: One area many people find difficult and confusing is web forms. Those simple on-screen "fill in your details" forms that are so common place yet can be difficult and problematic to produce. Well. That sums up the last fortnight of April-2005. Do not Forget To Rate 'HomeBiz-Tips'. Your valuable vote helps us to improve this E-Mag as well as allow us to keep it Ad-Free.